Blue Origin's reusable New Shepard rocket and space capsule launches from West Texas during its fourth successful test flight on June 19, 2016. Billionaire Jeff Bezos' Blue Origin launched and landed a reusable rocket for the fourth time Sunday (June 19), with the typically secretive private spaceflight company making its first-ever live webcast of a test flight during the successful mission. Blue Origin's unmanned New Shepard rocket and space capsule launched into the clear West Texas sky at 10:36 a.m. EDT (1436 GMT), carrying its crew capsule into suborbital space before both craft returned to Earth in separate landings. New Shepard's booster made a pinpoint landing near its launch site 8 minutes after liftoff, with the capsule touching down a minute lander after descending to Earth under two parachutes. Blue Origin's main goal for the flight was to test how the capsule would perform with just two of its three main parachutes deployed. 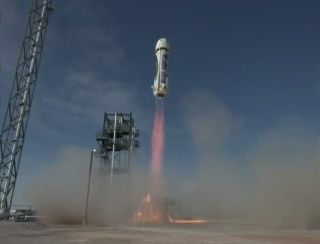 During Sunday's launch, New Shepard reached a peak altitude of 331,501 feet (101,041 meters). That's 62.7 miles (101 kilometers), just above the 62-mile boundary between Earth and space. While the capsule only needs one parachute to land safely, it carries three to be safe and Sunday's test monitored how the craft would handle a two-chute landing, according to Blue Origin representatives. "That was magic," said Ariane Cornell, of Blue Origin's Strategy and Business Development team, who was a co-host during the live webcast. "It was an impeccable test mission for us." Blue Origin's New Shepard space capsule descends back to Earth under two of its three main parachutes during a test of its two-chute landing capabilities on June 19, 2016. Amazon.com founder Jeff Bezos leads Blue Origin, a commercial aerospace firm that hopes to send people on suborbital and orbital space trips. See how Blue Origin's New Shepard spacecraft works here. New Shepard is not designed to launch all the way into orbit. Instead, the launch system is built to fly up to six people into suborbital space, with the capsule returning to Earth under parachutes while its booster lands vertically using the same BE-3 rocket engine it uses for launch. The Kent, Washington-based Blue Origin plans to sell tickets for space tourism flights on the capsule, but has not yet released a price for those joy rides. During such flights, passengers will experience several minutes of weightlessness and be able to see the Earth from space through New Shepard's huge windows, Blue Origin representatives said. "You have no idea how badly I want to fly on this right now," Blue Origin engineer Geoff Huntington, a webcast co-host, said just before the launch. The New Shepard capsule can also carry research payloads and has done so on past test flights. During Sunday's launch, the capsule carried three different microgravity science payloads, including a dust collision experiment for Braunschweig University in Germany; a fluid flow experiment for Louisiana State University and William Jewell College; and fluid shape experiment for Purdue University. Blue Origin's New Shepard booster approaches its landing site in West Texas during its fourth launch and landing test on June 19, 2016. Sunday's Father's Day flight marked the fourth launch and landing for New Shepard since its debut in November 2015, and follows similar tests in January and April. This latest flight was initially scheduled for Friday, June 17, but Blue Origin delayed it to allow time to replace a leaky O-ring on the booster. "Watching a rocket launch (and rocket landing!) might add a little extra fun w/kids on Father's Day. #GradatimFerociter" Bezos wrote on Twitter on Friday. And that was the case for at least Huntington. "This definitely made my Father's Day," he said. Huntington said the public should expect more New Shepard test flights to come this year, including a demonstration of the crew capsule's in-flight abort system to pull astronauts to safety during a launch emergency.